It is important to realize the decisions you make now about handling your finances and borrowing money will affect you in the future. Companies known as credit bureaus keep track of your debts and how you repay them by communicating with your lenders. These same agencies make this information available to other lenders in the form of a Credit Report or a Credit Score. Creditors, companies that issue lines of credit or services including car loans, use this information to determine just how much they want to lend you, and just how much they will charge you overall. 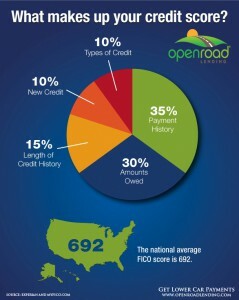 Your credit score represents your individual financial trustworthiness. The better your credit standing, the more likely creditors will be willing to work with you. By maintaining good credit, you will receive lower interest rates, lower payments, and greater ease in borrowing money. Good credit means that your history of payment, employment, residential status and salary make you a good candidate for a car loan. Conversely, bad credit can be a problem, and prevent creditors from doing business with you. Poor credit results when you make payments late or not in full, and even borrowing too much money can signal a red flag that you are over extended and may be unable to make payments. What does all this mean? Well, it means that you might have trouble getting car loans, a mortgage, credit cards, a place to live, and sometimes even a job. Good credit is important both now and in the future. In most cases, it takes seven years for accurate, negative information to be deleted from your credit report. Bankruptcy information takes even longer to be deleted, and may remain on your report for 10 years. A poor credit history can haunt you for years, which is why its important to learn how to maintain good credit before there is a problem. The process may seem complicated at first, but it gets easier once you understand the basics of credit and how it works. You can, and should, find out your credit score before you apply for credit. Some unscrupulous auto dealers have been known to lie about your credit score in order to give you a higher interest rate. You can access your credit score from FreeCreditScore.com. Your credit payment history is recorded in a report maintained by consumer reporting agencies or credit bureaus such as Equifax, Trans Union and Experian. Your credit record contains information provided by businesses and public records – information such as court documents, property taxes, residence, income, debts, and credit payment history. You have a right to review your credit payment history on file with the credit bureaus. The Fair Credit Reporting Act (FCRA) was established, in part, to ensure that accurate and complete information is maintained by the credit bureaus. Frequently Asked Question: How does applying for an auto loan or car refinancing affect my credit score? For this, we went straight to the source to find out. Experian, one of the largest credit reporting agencies in the US states that any inquiries within a 14 day period are treated as one inquiry related to the impact on your credit score. Experian goes on to say, “Because credit scoring systems count multiple auto loan inquiries as a single inquiry, shotgunning does not affect a person’s ability to qualify for credit.” That inquiry affects your credit score 5-7 points depending on which credit reporting agency you are using. You can read in its entirety Experian’s Impact on Your Credit Score article here. If you have been denied credit because of something in your credit report, you are entitled to a free credit report so you can see the evidence that the credit grantor relied on to make its decision. Even if you have not been denied credit, you can receive a copy of the report free once each year to determine its accuracy. This also depends on the state you live in. Other times the fee is nominal. It makes sense to check your credit report once a year to make sure all information reported is up to date and correct. If you find any mistakes, you have the right to get them corrected. You can request the reporting agency to investigate the disputed information and correct the error at no charge. You can also add a written statement to your credit file. 3. Avoid New Credit – Only apply for new credit when you absolutely need it. The best way to boost your credit score is to keep revolving balances low and make all of those payments on time. If you are just starting to build credit, make sure you don’t open up to many accounts to soon. Car Loans for Bad Credit – What Options Exist?